The principal building of what we now know as Crozer Theological Seminary was in the year 1858 the home of a coeducational normal and high school. The original "Old Main," the nucleus around which Crozer's entire history developed belonged to John Price Crozer. 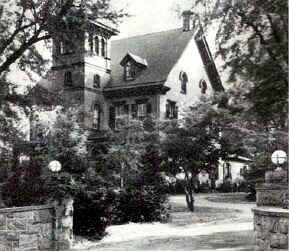 In 1859, the school's name was changed to the Upland Normal Institute, and it continued as such until the outbreak of the Civil War. The enlistment of students disrupted classes and the empty building was converted into a Union hospital. But after the Gettysburg battle, wounded Confederate prisoners were interned there. The Pennsylvania Military Academy - parent of Pennsylvania Military College - rented the school property in 1866 when its building had burned down. So it really was not until John P. Crozer's death in 1866 that the founding and unbroken history of Crozer began. 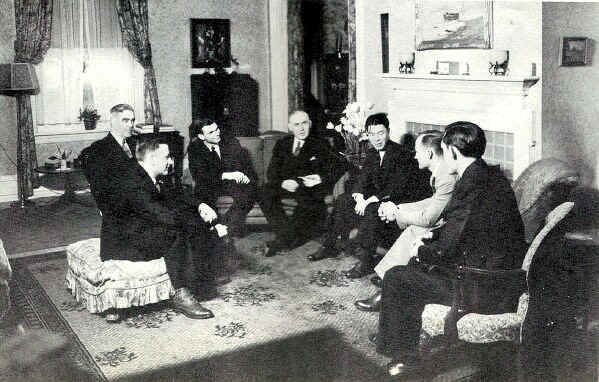 The heirs of Mr. Crozer, meeting to discuss the disposal of property and other matters pertinent to settling the estate, agreed to donate the site and building, then idle, for the purposes of theological education. A son-in-law, Dr. Griffith, suggested that the theological department at the University of Lewisburg (forerunner of Bucknell University) be moved to Chester. Accordingly an agreement was reached with the Lewisburg authorities, giving their graduates status as Crozer alumni and accepting their undergraduates to proper class standing. On Friday, October 2, 1868, the doors of Crozer Theological Seminary were swung open "to education for service." Transferred Lewisburgers numbered sixteen juniors and four middle class men. Obviously there could be no senior class at first, and the year 1869 passed without graduation exercises. Although founded by Baptists, and having had many Baptist trustees. Crozer nevertheless sought from its inception to render service to all denominations. However, it did, and still does, stress strongly the Baptist principle of religious liberty and the individual's right to his own personal convictions. Think for oneself; follow wherever truth leads, and seek the eternal and living realities back of Christian theology. These were and are the intellectual and spiritual precepts guiding the students at Crozer. Crozer men and women, students and teachers, discover that reality in religion leads into service; a practical service - be it church activity, religious education, or social and community work - in aiding and assisting one's fellow men. This then is the basic purpose guiding those at Crozer, and to which Crozer is dedicated. (Above Left) CONSTANT BUT TACIT reminder of the days when Crozer was a Confederate prison, are the door panels of the main building with their signs of having had peep holes cut into them. By glancing through the small windows in the doors the Union guards could tell whether or not the "Johnny Rebs" were acting like well-behaved captives. When the Nation was restored to peace and the building once again echoed with student laughter instead of military commands, the doors were repaired. 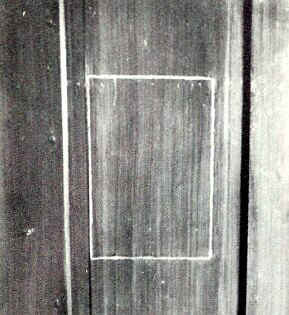 But the edges of the removed portions (outlined in chalk) are still visible through the paint. Grouped around the Administration building, set in the center of the campus, are the Library, Commencement Hall and residences for both faculty and student families. Formerly used only on Graduation Day, the Commencement Hall was converted into a gymnasium when the old one burned, and outfitted with heat, lights and inside screens and became an active athletic center for basketball and physical education. Crozer's growth into a forty-one acre campus with fifteen separate buildings, an apartment building, and an off-campus row of eight houses has been a gradual process. Much of the expansion was brought about by the generosity and interest of the Crozers who made sure the Seminary's material needs were well taken care of. (Above Right) CROZER'S ENTRANCE seems friendly and hospitable as does the faculty house just within the Gates. Family life is well-established as many students set up housekeeping on the grounds. In Upland a row of eight houses is available for student families, while in "Sunnyside," at the west end of the Campus, are apartments for seven couples. (Above) PEARL HALL, the ivy covered memorial Library, was the gift of William Bucknell who dedicated it to his wife, Margaret Crozer. In addition, Mr. Bucknell also gave a $10,000 endowment called the Margaret Crozer Fund and $25,000 for book purchases. Called "Pearl" because "Margaret" means just that, the Hall houses 60,000 books, pamphlets, magazines, periodicals and the valuable American Biblical Historical Society collection. Back in the early days it was a real student who could read for hours in the Library. Lack of heat sent most students scurrying out as soon as they got their desired books. The Librarian on duty managed to brave the atmosphere by taking the chill off his room with a small stove. Now it is no longer a test of physical endurance to linger in the Library. THIRD PRESIDENT of the Seminary, Reverend James H. Franklin possesses a keen sense of humor and a quick appreciation of what goes on around him. 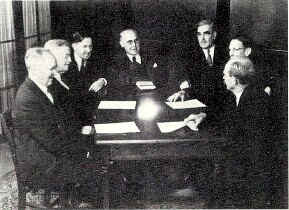 The Seminary has made great progress under his leadership since he took office in 1934. 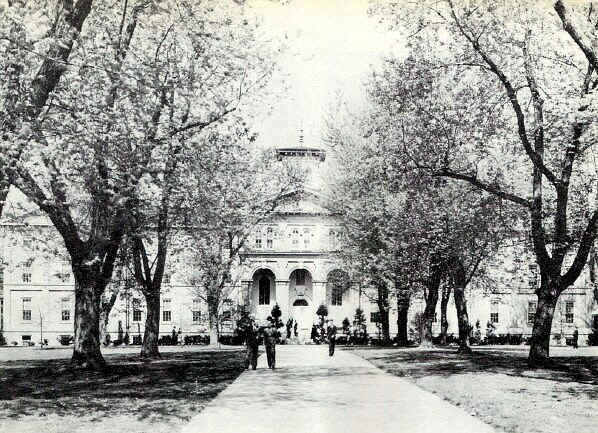 Besides fostering a plan to improve the campus property, Dr. Franklin instigated Orientation Week, when the new men, three or four days ahead of their future companions, as incoming students, are subjected to a round of introductory lectures. conferences and informal student gatherings, all designed to acquaint them with the life they will lead for the next three years. Concluding event in the program of "neophyte" instruction is an outing and picnic supper at Valley Forge. 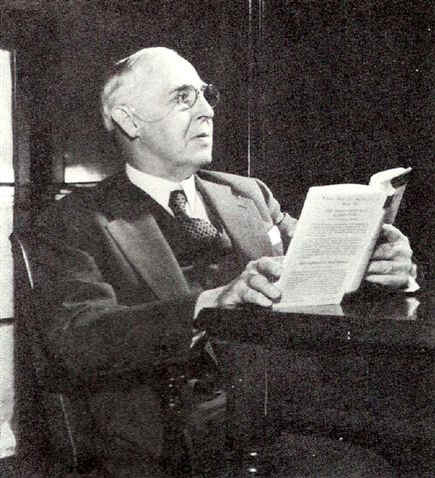 Crozer's first president, the Reverend Henry G. Weston of New York, helped to build up Crozer to a position of recognized standing during his forty-one years of administration. It was through his personal attributes of wisdom, scholarship and character that the confidence of Baptists was won. 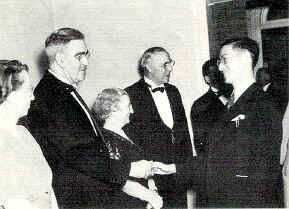 (Left) AN INFORMAL RECEPTION followed the school year's matriculation address given by Dr. Isaac G. Matthews, eminent authority on Old Testament literature and exegesis. Speaking on 'The Background of Prophecy," Dr. Matthews humanized the spiritual giants of the Bible, making them real individuals who lived in a very real world. He defined the prophets as men who, in speaking to their fellow companions, did not predict the future but rather waxed indignant over the abuses and flagrant misuse of ethical and religious concepts. At the matriculation ceremony were 35 members of the entering group. which has the distinction of being one of the largest groups of new students in Crozer's history. Total enrollment never exceeds moderate size, which affords close association and better instruction. It is felt the intimate contacts yield a richer human understanding, more desired and more valuable than a well-padded enrollment list. Usually the wives of married students take work at Crozer. (Above) THERE ARE ten Orientals going to school at Crozer. Each one of them is a leader in Christian work in his own country. 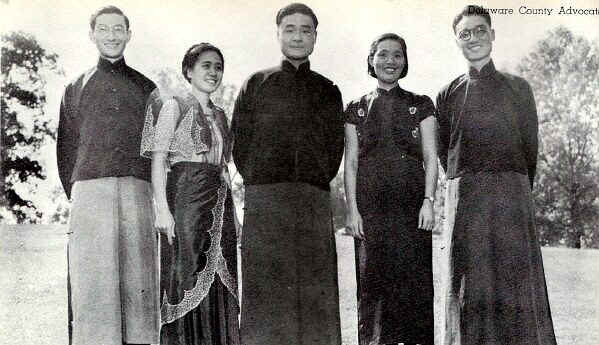 Pictured here in the traditional dress of their native land are (left to right) Liang-Mo Liu, Shanghai, China; Irene J. Ledesma, Jaro, Iliolo, Philippine Islands; Homer C. Loh, Chekiang, China; Siu-Chi Huang, Fukin, China; and David T. C. Cheng, Hong Kong, China. TYPICAL of Crozer and the atmosphere in which students and faculty live is this professorial "At Home." At times like this, informal discussion predominates and a free interchange of views and ideas takes place. Contrary to popular belief, the students do not take turns preaching on Sunday. In fact no church worship is held at Crozer on that day, because almost everyone is working or worshipping in some other church. At Chapel and Vespers, guest speakers and faculty members conduct the services. But all of the prospective pastors are given classroom instruction in the preparation and delivery of sermons, with opportunity for preaching. And there is a competent director of music and instructor in public speaking.